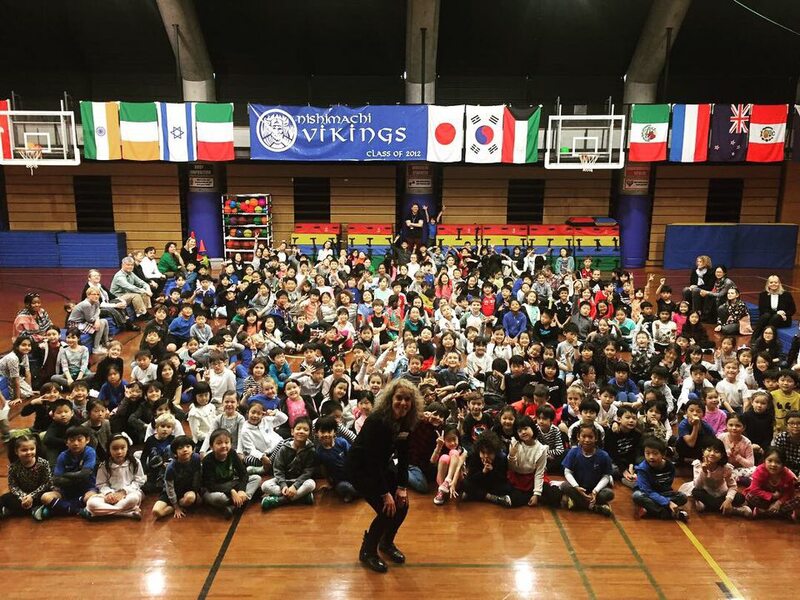 I recently taught twenty-one workshops in Japan to hundreds of students aged from three years old to High School students and adults. It was a wonderful experience and I had time for sightseeing in between. To teach such a range of ages I prepared a number of different workshops, which I then customized for each class. I visited five international schools: Marist Brothers in Kobe, Nishimachi International School, Tokyo, New International School, Tokyo, The Montessori School of Tokyo, and St. Mary’s International School, Tokyo. I also conducted workshops at the Itabashi Art Museum in Tokyo and the Society of Children’s Book Writers and Illustrators Japan. I traveled with my husband and fellow illustrator, David Flaherty. We began our trip with a few days of sightseeing in Kyoto. From Kyoto we traveled by high-speed train to Kobe, where I had the first full day of workshops. I taught a variety of classes: collage, illustrating animals, and illustrating emotions for the upper classmen. After the great day at Marist Brothers School in Kobe, we went to Tokyo. It was very nice and an honor to be greeted at the Yayoi Kusama Museum by Ms. Megumi Takasugi from Kusama’s studio who told me how much Ms Kusama loved the book. I taught two-full days at the Nischimachi International School: one day for the elementary school and another for the middle school. I was welcomed by a large collage mural of a spread from Yayoi Kusama: from Here to infinity created by the grades one-five students and led by their dynamic teacher, Erica Grainger. In between workshops on collage and working with dots and patterns, I spoke to the school assembly. the students were very engaged and had lots of questions. The next day I conducted two workshops for the reknowed Itabashi Art Museum for families. Following a reading of the Kusama book (in Japanese with the translator) we created and named our own infinity rooms. the families were wonderful to work with and the Itabashi Art Museum organizers were great hosts. The next afternoon I led a collage workshop with the Society of Children’s Book Writers and Illustrators Japan chapter. The regional advisors, Holly Thompson, Mariko Nagai, and Naomi Kojima were also very helpful in my planning this trip. It was a fantastic time and afterwards a bunch of us went to dinner. Such a treat to connect with the community or writers and illustrators in Tokyo. The next few days of teaching were packed and flew by quickly. I taught a special illustration workshop for a group of thirty students middle and high school students at the New International School. Another full day at Nishimachi International school with the middle school students, followed by a full day at the Montessori School of Tokyo, where I taught a range of workshops. The librarian at MST, Elizabeth Ogiyama was instrumental in planning and coordinating my visits, a very big thank you! The teaching period culminated with a full day at the all boys’ academy of St. Mary’s International School. There I taught a range of workshops including an intensive for a select group of Advanced Placement students who have their goals set on attending art colleges in Japan and abroad. After the busy and rewarding teaching, we went to Hakone where we were rewarded with perfect weather and views of the elusive Mt. Fuji. 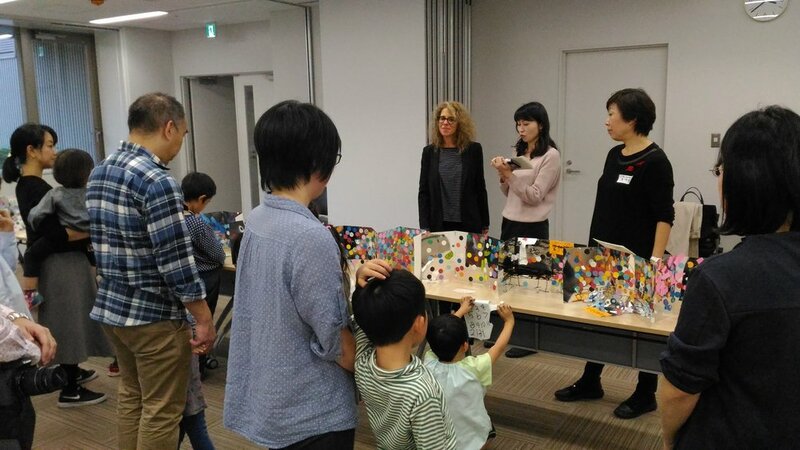 It was an amazing experience and many thanks to all the teachers, librarians, students, SCBWI Japan and Itabashi Art Museum for the gracious hospitality. This was my first visit to Japan and I will definitely be back soon! !